Bière brune au miel de fleurs d’Alsace. Ingrédients : Eau, Malts (Pale Ale, Munich 20, CaraAmbré, Chocolat, Blé), Houblons (Nugget, Cascade, Triskel), Miel de fleurs d’Alsace, Sucre, Levures. Bottle poured into a tulip glass. The beer is a dark brown with a beige head of foam. The aroma is toffee and roasty notes. Sweet and estery in the taste. Medium body and medium carbonation. Seems to have used a Belgian yeast strain. 26/XI/16 - 33cl bottle @ Vini Birre Ribelli (Brussels) - BB: n/a (2016-1419) Thanks to sebletitje and 77ships for sharing today’s beers! Clear red brown beer, small creamy off-white head, unstable, non adhesive. Aroma: lots of oxidation, caramel, honey, dried fruits. MF: soft carbon, full body. Taste: sweet start, very very sugary, honey, some caramel, lots of overripe banana, soft bitterness, bit metallic, soft acidity. Aftertaste: bitter touch, very sugary, sweet caramel, lots of honey. Not my cup of honey tea. Bottle from a local supermarket in Straßburg. Pours cola colored. Nose is chocolate, nuts, caramel. Palate is sweet, toffee, bread. Sweet and short finish. A bit boozy. Nothing special, but decent. Bue en bouteille au VBR à Bruxelles, Couleur brunâtre, peu de mousse peu d’effervescence Nez sur le miel et le sucre Bel équilibre sur le malt et le miel avec un côté sucré bien équilibré. Bel effort. Bottle sample @ Vini Birre Ribelli ’16. Ambrée, col fin beige. Arôme malté, cara pâle, miel est modéré avec un apport léger organique, les houblons assez variés restent trop en retrait conférant un bouquet moyen fruité. Palais est léger, malté caramel plus présent, biscuité avec une petite douceur de miel qui arrive sur la fin. Les effets houblonnés s’estompent un peu sur la base malt plus dominante. J’attendais plus des houblons. Muddy brown, messy floral, honeyish, yeasty. Has a harsh homebrew character, yeasty, nothing positive. Brown color, large frothy head. Metallic aroma, chemicals; caramel and yeast flavor, just a bit of sweetness in the final, chemicals, roasted nuts. 330ml bottle at Matt’s. Aroma is herbs, caramel, some coffee, toffee and woody notes. Taste is herbs, hoppy bitterness, woody. Not bad. 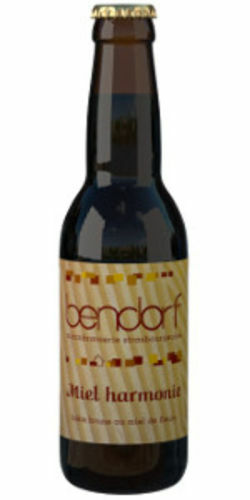 330mL bottle, pours a dark brown with a small beige head. Aroma brings out light cocoa, some caramel malt and bready notes. Flavour brings out bready notes, a touch of honey, and dirty earthy yeast. Not sure what this is supposed to be -- it’s just a weird yeasty mess.